Saatva Mattresses occupy a unique position among “mattress-in-a-box” online mattress retailers. While most online mattress sellers offer perks such as free shipping, free returns, and 100-night risk free trials, Saatva is one of the few online retailers that did not begin by selling memory foam (or related) mattresses. 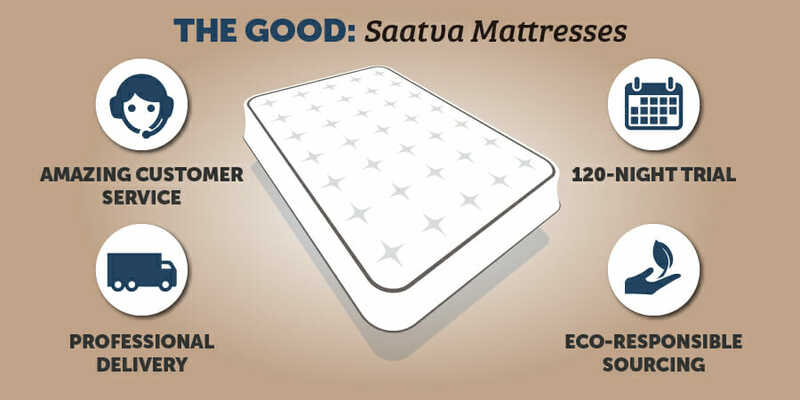 Saatva mattresses are distinctly made of eco-responsible materials, offer three firmness levels (also unique among online mattress sellers), and constructed their original mattresses from coil spring technologies. This places Saatva in a uniquely prominent position for would-be online mattress shoppers who are not looking for memory foam mattresses. Since their beginnings, Saatva have diversified their mattress offerings. In 2016, Saatva began offering their Loom and Leaf memory foam as well as high-end Zenhaven natural latex brand. All three brands offer the same warranties, delivery methods, and easy returns. Additionally, Saatva has continued to focus on eco-responsible sourcing methods for materials used in mattress construction across all three of their brands. In fact, Saatva was founded with this as one of the central aims of the business. The name itself is taken from the Sanskrit word for “pure” (sattva), doubling down on the focus on quality materials from the start. 10,000’s of reviews have been left for Saatva mattress brands online. These verified reviews, through Trust Pilot, Google, Amazon, and Saatva’s own sites have been overwhelmingly positive. In fact, across all review sites Saatva mattresses have been reviewed with an average score of 9.7/10 or 4.9/5 (depending on the scale and review site). This makes Saatva a strong contender for the most highly reviewed collection of mattress brands anywhere online. Add to this the fact that they offer one of the widest ranges of mattress types, materials, and price points among online mattress retailers, and Saatva is a clear standout in the space. When including the three Saatva brands (Saatva, Loom and Leaf, and Zenhaven) over 30,000 verified reviews of Saatva products have been left on review sites online. Depending on the scale, Saatva products and the experience of users has gained average ratings of 9.7 out of 10, or 4.9 out of 5. While these numbers vary slightly by Saatva brand, one can easily say that Saatva is one of the most highly reviewed mattress companies online. For our rundown of what customers found the best about their Saatva buying and sleeping experience, we look at reviews averaging at or above 8 in 10 or 4 in 5. Industry-leading 120-night risk free trial. Real-time answers to questions online. Over 8,100 of Saatva’s 9,700 verified shopper Google reviews rated their Saatva mattress 5 of 5 stars. When looking at 4 and 5 star reviews, this encompasses over 9,300 of 9,700 reviews. That means that 96% of verified Saatva customers rate their mattress 4 or higher of 5 stars. Of over 1,000 verified shopper Google reviews, 88% rated their Loom and Leaf mattress and experience with 5 of 5 stars. An additional 7% of shoppers reviewed their Loom and Leaf mattress with 4 in 5 stars. That means that 95% of verified Loom and Leaf customers rated their mattress 4 or higher of 5 stars. While a large number of Zenhaven mattress reviews are bundled with Saatva company reviews. Several sites do host verified customer review locations for Zenhaven specifically. ResellerRatings.com has close to 300 Zehnaven mattress reviews with an average rating score of 9.77 out of 10. Of those reviewers, 90% rated their Zenhaven mattress with top marks. While an additional 5% gave their Zenhaven Mattress 8 out of 10. This is in line with other Saatva brands, with 95% of customers rating their Saatva mattress 4 or higher out of 5 stars. As mentioned in the last section, reviewer responses to all three Saatva brands are overwhelmingly positive. With that said, however, no one mattress or mattress brand is going to have the proper mattress for every type of sleeper. Below we’ve highlighted some of the common responses from reviewers who had a “bad” experience with Saatva. As our next section will focus on the worst of the reviews, it’s worth noting that “the bad” are often respondents for whom a particular mattress didn’t work, or who had bad experiences with customer service or delivery. With that said, many respondents in this range still choose to keep their mattresses, they just often have some caveat they would like to note in an otherwise decent review score. For the purposes of this section we looked at reviews rating Saatva products of experience at around 3 in 5 or 6 in 10. More than 95% of Saatva mattress reviewers rated their experience 4-5/5 stars. With that said, a small but notable number of reviewers have had some trouble with either the buying process, customer service, delivery, or the product itself. In the case of the Saatva brand of mattresses, 3% of verified customers rated their experience with 3/5 stars (or the equivalent on a 10 star system). Below are some of the most common Saatva-brand specific complaints. As we mentioned in the section on positive reviews, over 95% of Loom and Leaf verified purchaser reviews record 4 or higher out of 5 reviews. With that said, a small group of customers did have problems with the buying process, customer service, or delivery. Of 4,000+ Loom and Leaf reviews by Google verified customers, around 80 rated their experience or product with 3 in 5 stars. Below are the most common complaints from customers rating their experience 3 out of 5. As with the other Saatva brands, a large percentage of Zenhaven reviews are very positive. In fact, 95% of Zenhaven reviews rated their experience or mattress with 4 or more out of 5 stars. With that said, 5% of verified purchaser reviews on ResellerReviews.com did rate their Zenhaven mattress purchase or purchasing experience with 3 out of 5 stars (or the equivalent). Below are the most common complaints from Zenhaven customers rating their experience 3 out of 5. For a very small percentage of Saatva customers, their buying experience or mattress were entirely unsatisfactory. For these mattress shoppers, they reported a problem with Saatva beyond small communications gaps or just not choosing a mattress that works for them. We quantified these reviewers by looking at 1-2 star reviews (out of 5) or 1-4 star reviews (out of ten). These are respondents who are unlikely to recommend the product and who likely returned or stopped using their Saatva products. For context, only about 1% of verified purchaser reviews for Saatva, Loom and Leaf, and Zenhaven were rated within the 1-2 star range. Below are some of the most common complaints among these reviewers. Saatva mattresses originally came in the sizes of twin through california King in their three “comfort levels” for box spring mattresses. As the brand expanded, they began offering a comparable number of offerings through their memory foam brand Loom and Leaf, as well as their more expensive higher-end brand Zenhaven. Today, queen-sized mattresses from Saatva brands range from $1,099 to $1,899. At the lower level (Saatva’s original brand), Saatva mattresses fall squarely into mid-tier mattress prices. At this level the brand competes with other online mattress retailers like Purple, Casper, and others. Where Saatva really shows out as a different sort of company, however, is in their offering of memory foam, coil spring, and latex mattresses. So while Saatva’s price range varies more greatly than “competitors,” they also provide a much wider range of offerings. Below we’ve detailed prices of all mattress products offered by all three Saatva brands. *All mattress sizes offer 11.5″ or 14.5″ height with no difference in cost. Comfort levels including Luxury Firm, Plush Soft, and Firm cost the same and are billed according to mattress size. **Comfort levels include Relaxed Firm and Firm for each bed size. Both comfort levels are billed the same. ***Comfort levels include Gentle Firm and Luxury Plush for each bed size. Both comfort levels are billed the same. When looking at all three Saatva lines (Saatva, Loom and Leaf, and Zenhaven) there’s a wide variety in price points to consider. While Saatva’s original mattresses compete with the likes of other online mattress retailers like Leesa, Casper, and Purple, Loom & Leaf, and (even more so) Zenhaven compete with even higher end mattress brands. We’ll take a look at how all three Saatva mattress brands compare to competitor brands below. Are the Original Saatva Mattresses Good Values? The original Saatva mattresses range from $599 to $1,499 depending on the mattress size. Each size comes in three different firmness levels as well as two mattress heights. All six options utilize the same coil spring technology and eco-responsible sourcing. At this price point, Saatva tracks closely with other online mattress retailers. A comparison of queen-sized mattress prices for Saatva and competing brands may be seen below. While Saatva is the most expensive of the peer brands listed above, Saatva does stand out on a few counts. Firstly, Saatva is the only coil spring mattress maker of the brands listed above. While many sleepers do like memory foam (or closely related) mattresses, there are many sleepers who do not. Common complaints include the higher number of off gassing chemicals in memory foam, the fact that memory foam sleeps hotter, and the “sinking” feeling that some memory foam mattresses provide. If you’re looking for the perks of a “mattress-in-a-box” online mattress retailer, and don’t want a foam mattress, Saatva pretty clearly stands out as one of the only choices at this price point. It’s also worth comparing Saatva to traditional mattress sellers. Mid-tier mattresses — which all of the above brands claim to be — typically cost above $1,200 and below $1,800. While many online retailers are able to cut some costs due to not having to split profits with salespeople and lowered overhead, Saatva still falls below the range of a traditional mid-tier mattress. In fact, the eco-responsible sourcing and number of options offered on Saatva mattresses likely makes it more of a high-end mattress anyway. In this case, Saatva mattresses are significantly more affordable than your average high-end mattress (often cited as starting at $1,800). Are Loom and Leaf Mattresses Good Values? Loom and Leaf mattresses comprise Saatva’s memory foam line of mattresses. These mattresses cost between $749 and $1,649, depending on the size mattress chosen. While one could say that Loom and Leaf mattresses are direct competitors of other online mattress retailers (most of whom primarily sell memory foam mattresses), many of Loom and Leaf mattress features are more akin to higher-end brands. Proprietary cooling technologies, no off gassing memory foam, eco-friendly foam materials, organic anti-microbial covering, and a 15-year warranty are features in line with a brand like Tempur-Pedic. For the sake of illustration we’ll also compare queen-sized Loom and Leaf prices to higher end mattresses of brands like Purple. While a significant step up in price compared to Saatva mattresses, Loom and Leaf mattresses still fall solidly within the “mid-tier” mattress price range. With specifications that stack up against the highest-end online mattress retailer offerings, Loom and Leaf mattresses are actually a pretty amazing deal. Add to this that Loom and Leaf offers a range of firmness levels (unlike most online mattress retailer peers), and the comparison becomes even more favorable: competing Tempur-Pedic offerings cost almost four times more! Of course if one is looking at all online mattress retailers offering memory foam mattresses, Loom and Leaf does fall at a higher price point than many basic offerings. But there’s really no way to find Loom and Leaf as being comparable with basic Purple, Casper, Leesa, or Ghostbed models. With that said — if you’re definitely looking for an online sold memory foam mattress — the only reason not to try a Loom and Leaf mattress is if you don’t want to go into the “mid-tier” price range. In this case there are more affordable memory foam mattresses, with low-end models often costing $300-$500. Are Zenhaven Mattresses Good Values? Zenhaven comprises Saatva’s line of latex mattresses. Latex mattresses are uncommon to come by in the largest online mattress retailers. Though there are a growing number of “green” and organic “mattress-in-a-box” companies. Even though there aren’t as many large competitors, latex has long been seen as a gold standard for eco-friendly and non-toxic mattresses and accordingly there are a number of traditional mattress makers to compare Zenhaven to. Zenhaven mattresses are coated with organic wool, for anti-microbial, anti-bacterial, flame-retardant, and breathability purposes. Inside, all-American Talalay latex built into five support layers offers the gold standard in no off-gassing or chemical byproducts. Unlike mattresses that use petroleum-based or synthetic foam, Talalay latex provides greater breathability, durability, and lack of potential toxicity. For this reason the real brands to compare Zenhaven mattresses to include top-of-the-line organic and eco-responsible mattresses. Below we’ve listed a few peer mattresses as well as prices for queen-sized beds. While it’s clear that Zenhaven is a reasonable price for it’s high-end organic and eco-friendly specifications, it’s important to note that the real value of Zenhaven depends on the priorities of customers. If you’re primarily just looking for an non-toxic mattress bought online, there are more affordable options including Avocado, Plushbed, and Happsy. Additionally, Plushbed in particular is noted for the quality and breadth of their organic certifications. It’s worth noting that none of these competing brands, however, are as highly reviewed, offer quite the range of choice, nor are as established as Zenhaven. Zenhaven is a relatively new brand, though more well established than many online mattress retailers (as well as potentially the best reviewed of all online mattress companies). This is important for shoppers who want to ensure a brand will still be around to honor the warranty or for replacements later in the mattresses life. Additionally, Zenhaven offers a few unique features, such as mattresses that offer different firmness levels depending on which side of the mattress is on top. As well as a top-of-the-line 20 year warranty and 120 day risk-free trial. When comparing Zenhaven to traditional mattress makers utilizing eco-responsible sourcing and non-toxic materials, the value proposition is more clear. Many comparable mattresses sold in brick and mortar stores are well above $3,000. In fact, many latex mattresses sold in department stores are over $10,000! Zenhaven does occupy a top-tier mattress price point, which is generally considered to start at $1,800. Though it’s top-of-the-line specifications don’t come with a price tag that is completely obscene. For this reason we rate Zenhaven as a strong value among peer brands. What Makes Saatva Mattresses Unique? Saatva mattresses are unique on several counts. If you’ve never bought a mattress online through a “mattress-in-a-box” provider, then you will likely find the delivery method, 120-night risk-free trial, and ability to return the mattress unique. Among both traditional and online mattress retailers Saatva is also unique in their focus on eco-responsible materials, and their range of offerings. Saatva brand mattresses include Saatva mattresses, Loom and Leaf mattresses, and Zenhaven mattresses. These three brands provide delivered-to-your-door mattresses in coil spring, latex, and memory foam varieties. These are by far the three most common mattress types, though most online mattress retailers just focus on one. For those that have had good past experiences with Saatva brands, knowing they can buy a whole range of mattress types from the same provider is a definite perk. Additionally, most mattress in a box manufacturers have relatively limited offerings. They often sell 2-3 mattress models. Saatva offers a number of firmness levels as well as thickness levels on a variety of mattress types. Simply put, compared to other online mattress retailers, Saatva provides more choice for shoppers. Finally, most online mattress retailers only offer memory foam mattresses. While there are many sleepers that love memory foam, many sleepers don’t like the feeling of sleeping “hot,” “sinking” into the mattress, or off-gassing that can occur. Saatva’s coil spring offerings through an online interface are unique in this aspect. If you’re looking to buy a coil spring mattress online, Saatva is one of the few brands specializing in this mattress type. While there are other eco-responsible mattress brands, few are as affordable or offer the wide range of choice in mattresses that Saatva does. Eco-responsible memory foam mattresses — as those offered by Loom and Leaf — are particularly hard to come by online. One final aspect of the Saatva brands that is unique includes the variety of price points Saatva offers. The original Saatva mattress offers a lower mid-tier price point (“mid-tier” mattresses often sell for between $1,300 and $1,800). While Saatva’s higher-end Zenhaven brand offers a good value among higher-end price points (which can often go above $5,000). Since its creation, Saatva has excelled at distinguishing itself from competition and clearly communicating about their products and what makes them different. In fact, they’ve been recognized several times for the clarity of their messaging regarding their products. Even just with their initial products, Saatva was distinct among online mattress sellers on two counts: their focus on eco-responsible materials, and the fact that they make coil spring mattresses. In a space populated by many low to mid-tier online memory foam mattress companies, Saatva managed to ignite a slightly higher-end, safer and more eco-friendly brand. While doing that, Saatva managed to avoid marketing “fluff” and just let their products speak for themselves. While Saatva has not embarked on as many high profile ad campaigns as other online mattress companies, two tactics have helped to give credibility and awareness to their brand. First, the creation of an amazing customer service team that many customers note are very responsive, informative, and non-pushy. And second, the growth of a collection of potentially the highest reviewed mattresses of any other online mattress company. With tens of thousands of verified customer reviews, Saatva and it’s accompanying brands have managed to get average reviews of 4.9/5 stars. For context, this number includes around 95% of reviewers for all three brands reviewing their mattress and buying experience with four in five or greater. Saatva was founded in 2011 by furniture veteran Ron Rudzin and entrepreneur Ricky Joshi. Originally based in Austin, Texas, the luxury mattress ecommerce company has expanded sales exponentially over the last half decade. Saatva originally occupied a unique niche among online mattress companies, offering eco-responsible coil spring mattresses. While there are a number of large competing online mattress sellers, Saatva was the only brand at the time to offer coil spring mattresses delivered to your door..
Saatva’s focus on eco-friendly sourcing and production methods was baked into the initial conception of the company, named after the Sanksrit word for “pure.” Since 2016 Saatva’s growth has accelerated even more, and the brand has released two more lines of eco-responsible mattresses: Loom and Leaf, a luxury memory foam mattress brand, and Zenhaven, a high-end natural latex mattress brand. Another key component of Saatva’s history has been the formation and follow through of their sales philosophy. No Saatva members are on commision. Saatva attempts to be as clear as possible regarding specifications and messaging on mattresses. And Saatva seeks to sustainable make and sell new mattresses. These three facets of Saatva’s development have led to many principled shoppers giving Saatva a try. Additionally, the focus on customer-centered service has led to the brand being one of the most highly reviewed mattress brands online. For an online mattress retailer, Saatva offers a wide variety of mattresses. Besides offering three distinct lines made of different eco-friendly materials, Saatva also offers a number of mattress options within each line. Below we’ve listed the mattress options and sizes for all Saatva, Loom and Leaf, and Zenhaven mattresses. All Saatva mattresses come in both 11.5” and 14.5” thicknesses either of which may be chosen for no additional charge. Besides mattresses, Saatva, Loom and Leaf, and Zenhaven also offer a variety of bed base options. From the super basic bed frame through the state-of-the-art Lineal™ Adjustable Base, Saatva brands have mattress accompanying accessories for a variety of needs and price points. Below are the options and prices for Saatva mattress accessories. The Saatva bed frame is just what it sounds, a basic bed frame on which to lay your Saatva mattress. These frames measure 7.5” from the ground and are adjustable to fit every size bed. The Saatva bed frame costs $119 for every bed size, as the same frame is used for each. All frames built from heavy duty 2” oversized hardened steel. The Saatva bed foundation may be included with any Saatva mattress order. These foundations are constructed using a blend of slat construction, eco-friendly foams, and organic cotton. As a matter of preference, foundations may be ordered in 4.75” and 8.75” heights. Construction on both heights in identical. King and California King foundations are shipped split in the middle which aids in getting the foundation to you and being able to get the foundation through your entryways. If you feel that your queen-sized foundation will not fit through your entryway, these may be split upon request for an additional $35.Below are the prices for different sizes of Saatva foundations. Saatva’s Lineal™ Adjustable Base is a high-tech upgrade for nearly any bedroom. Offered in all sizes of mattress available through Saatva, the Lineal™ Adjustable Base comes split at King and California King sizes. Use the remote on this adjustable base to elevate your head, feet, or anywhere in between into a nearly infinite number of positions. Or try out some of the pre-sets for reading, relaxing, or a zero gravity feeling. Additional features of the Lineal™ Adjustable Base include under-bed illumination, three-speed full body, head, or leg massage, and an extremely quiet motor. Prices for the Lineal™ Adjustable Base by size may be seen below. 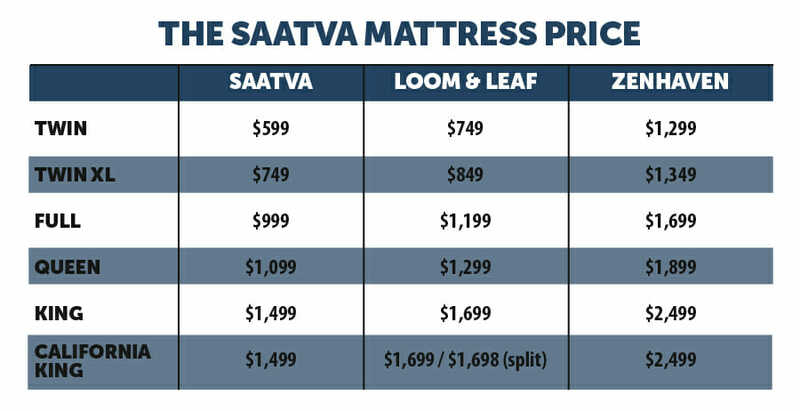 As Saatva, Loom and Leaf, and Zenhaven regularly point out, at current pricing, Saatva brands cost much less than traditional mattress makers. But a little extra savings never hurt. A few locations online offer discounts on Saatva mattresses. Though many of the promotions and discounts are actually ongoing parts of Saatva’s business model such as free shipping, and free returns for 120 days. For a look at a few locations that do have actual discounts on Saatva products, check out these links. The primary place to buy Saatva mattresses is through the homepages for Saatva, Loom and Leaf, or Zenhaven. Unlike traditional mattress brands and other online mattress retailers, Saatva has not expanded into any brick and mortar locations. Some other resellers such as Amazon.com do also sell Saatva, Loom and Leaf, and Zenhaven mattresses. Buying through a company like Amazon may be advantageous for the use and accrual loyalty program points. Though buyers should also be mindful that buying through a third party oftentimes does not provide the same warranty, returns, or customer service (three key parts of Saatva’s offerings).